Timco provides several types of insulation to fit all of our customer’s needs. Our insulation products range from traditional fiberglass insulation, spray in foam insulation and even board insulation. A fireplace is the focal point of every home and is recommended by home building experts as one of the top three ways to improve the resale value of the home. Timco’s fireplace experts are here to help you choose the best fireplace for your home or commercial building! Did you know that roughly 40% of the air in your home comes from the crawl space? That percentage includes mold spores, odors and humidity all within the air that you are breathing. At Timco, we can control your moisture problems using our highly effective encapsulation and dehumidifier system. Perfect for any grilling experience, Timco Insulation and Fireplaces of Morehead City also provide our customers with state-of-the-art grills. Visit our show room today to check out our latest products! Owner and Founder Tim Horne along with his employees have over 30 years of experience in the industry. 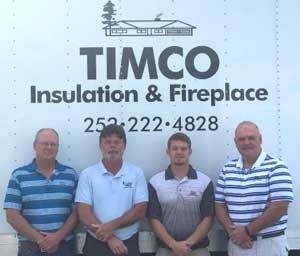 Timco Insulation and Fireplaces have been providing quality service and competitive pricing for customers in Carteret, Onslow, Craven and Pamlico counties since 2003. Our office personnel and sales team have many years of experience in the industry and can offer expert advice on all of your insulation and fireplaces needs. Please call our office to make an appointment 252-222-4828. Timco Insulation and Fireplaces is a Certified Open and Closed Cell Spray-In-Place Polyurethane Foam AirTight Dealer. Our Certified Trained applicators install Spray-in-Place Closed Cell Polyurethane Foam into ceiling and crawl spaces for existing homes, whole house applications for new residential, multi-family and light commercial projects. Timco Insulation and Fireplaces believes in providing the best customer service and top of the line products. We also enjoy educating our customers as well. 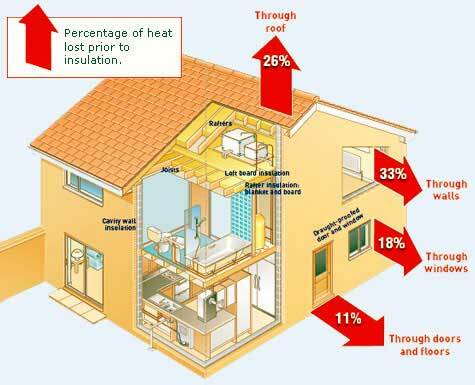 Did you know that 33% of heat and air can escape through your walls if not properly insulated? Below are a few benefits on keeping your insulation up to date and clean!